This is confusing: grains of paradise, above, are also known as melegueta pepper, not bo be confused with malagueta or malaguetta pepper. You can end the confusion below. Photo courtesy Dean and Deluca. 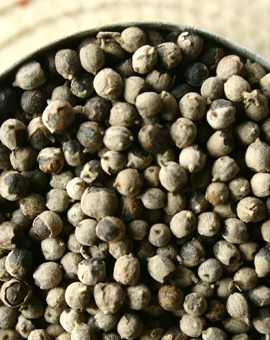 WHAT IT IS: Varietal peppercorns—20 different pepper types and counting. WHY IT’S DIFFERENT: Each origin of the world produces pepper with different aromas and flavors—just like coffee beans and chocolate. WHY WE LOVE IT: Another way to vary food accents—and it has no calories! WHERE TO BUY IT: Pepper-Passion.com, Kalustyans.com. One needs to pay careful attention here: Malagueta pepper (spelled with an “a”), used in Brazilian cooking, is a member of the capsicum family (Capsicum frutescens, a member of the Solanaceae family). A small red chile, about two inches long at maturity, it is found in the Bahia area of Brazil, it is a hot chile scoring 9.5 on a scale of 10. It is similar to the birdseye chile in both appearance and flavor. The malagueta chile apparently got its name from the unrelated melegueta pepper (spelled with an “e”—see the next listing), a West African spice, because the Brazilian state of Bahia was a center of slave trade: The Portuguese name for the African spice was transferred to the local capsicum. Malagueta is served throughout Brazil, typically minced with oil in a salsa, as a very hot table condiment or to season dishes. It is totally unrelated to the melegueta pepper of Africa, which comes from a ginger-like rhizome. Learn more about chiles in our Chile Glossary. This is Page 7 of an 11-page article and pepper glossary. Click on the black links below to visit other pages. 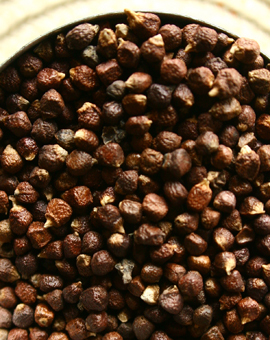 Aframomum melegueta, from the Zingiberaceae family (the ginger family), is also popularly known as grains of paradise. It was named by the Portuguese traders in the fifteenth century, who encountered it along the stretch of West African coast they called the Malagueta (now Liberia. 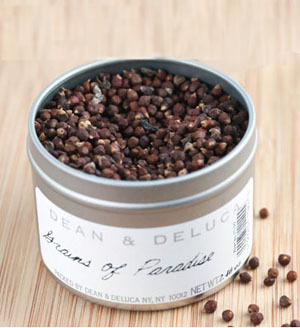 The name, “grains of paradise,” was developed by some clever spice trader looking to command a price for something rare. He claimed that the seeds grew only in Eden, and were gathered as the “grains” floated down the river out “of paradise.” Even coming from paradise, the spice was less expensive than the very pricey true black pepper (Piper nigrum). The melegueta pepper was soon overshadowed by chiles from the Americas, and dwindled in importance in both Africa and Europe. Grains of Paradise: Largely confined to West Africa, these tiny seeds are related to cardamom, and resemble the seeds inside cardamom pods. Photo by Brian Van Sise | THE NIBBLE. Use For: Grains of Paradise complement root vegetables, lamb and poultry, and combine well with allspice, cinnamon, cloves, cumin and nutmeg. They are generally confined to West African cookery, though sometimes may be found in Moroccan ras el hanout blends. The seeds are used in Scandinavia to flavor aquavit. *Kenneth Kiple, The Moveable Feast: Ten Millennia Of Food Globalization, 2007: Cambridge University Press, p. 58. From Hungary, moula is the tart and slightly peppery fruit of the chaste tree (Vitex agnus-castus), a small warm-climate shrub native to western Asia and southwestern Europe that is now common in much of the southeastern United States. The tree is so-named because, dating back to the beginning of the common era, the fruit was believed to suppress the libido. The Greek physician and pharmacologist Pedanius Dioscorides (40 to 90 C.E.) recommended it in beverages to help the wives of soldiers remain chaste while their husbands were away and Pliny, the great Roman natural historian (23 to 79 C.E.) wrote that the plant “checks violent sexual desire.” That use has been discounted in modern clinical trials, but it is efficacious as a homeopathic PMS remedy.† The small, taupe-colored dried berries are very hard, with a musty earth taste reminiscent of old wine. They don’t give off the same level of heat as most of the other berries, but are attractive as a garnish. Use For: Vegetable and meat dishes. Moula, or Chasteberries, from Hungary. Photo by Brian Van Sise | THE NIBBLE. †Other peppers in this glossary have a long history of medicinal and homeopathic use, but we have not focused on them. Szechuan pepper, for example, is used as an oral analgesic, a diuretic, to treat tapeworm, etc.